… when he [Prophet Muhammad (sawa)] said to his companion [Abu Bakr]: Do not grieve; indeed Allah is with us. First and foremost, there is no real question as to who spoke what. It is clear from the ayah of the Qur’an, hadith, historical records, and consensus, that the Prophet spoke the words “Do not grieve; indeed Allah is with us.” to Abu Bakr. Let us now analyse this ayah. 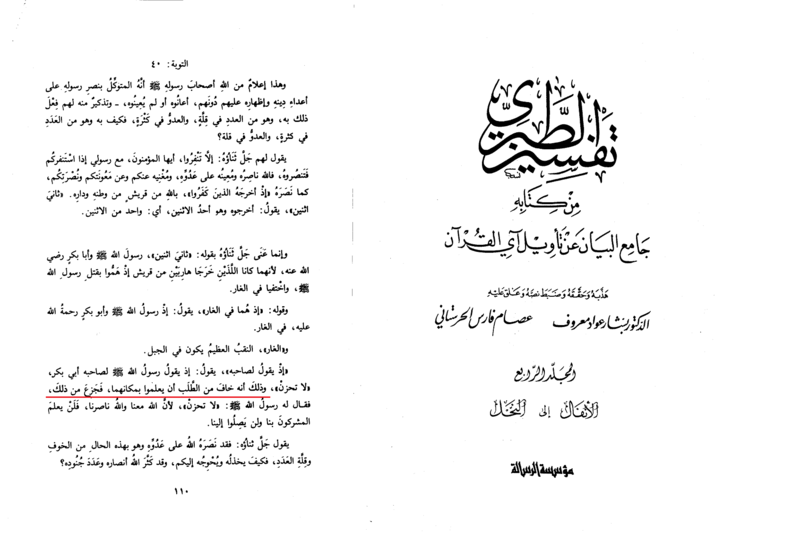 So we can conclude here, that Abu Bakr was afraid. Some would say afraid of the situation, some would say for himself, and some would say for the sake of the Messenger of Allah (swt). Regardless of what he was afraid of, the common ground between all mufassareen is there was fear in Abu Bakr, and also according to some he was also crying. Establishing this (that Abu Bakr was afraid) is important for when we analyse other ayahs within this article. Allah is with US ? Now we look at what was meant by the Prophet (sawa) when he said “Allah is with us”. The ‘Sunni’ commentators, obviously, take the position that this immense praise for Abu Bakr. Now, we see the context is obviously different here than 16:128 where Allah (swt) says: “Indeed, Allah is with those who fear Him and those who are doers of good.” So this “ma`iya” (being with) in 58:7 (who are hypocrites/disbelievers) is not the same as the “ma`iya” where Allah (swt) is with those who fear him and those who do good in 16:128 (who are believers). Al-Razi claims that “everyone that Allah is with – they must be from those who fear Him (muttaqeen) and doers of good (muhsaneen)” which is absurd and baseless, especially when looking at ayah 58:7! 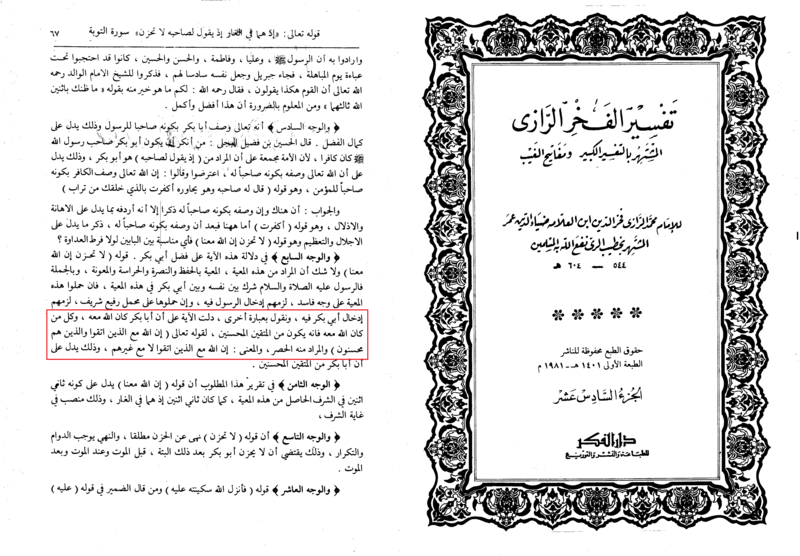 What proof does al-Razi have that this “ma`iya” (being with) of 9:40 is in relation to those who fear him and do good, while presenting no evidence? Why did he not, for example, say that everyone who Allah (swt) is with are those who observe patience – due to the statement of Allah (swt): “Indeed, Allah is with the patient.” (2:153 / Sahih International) ?? Of course he cannot apply this ayah to Abu Bakr, because he did not have patience when he lost faith and hope that they would be saved and had fear and began to cry, resulting in the Prophet (saws) telling him to not grieve. 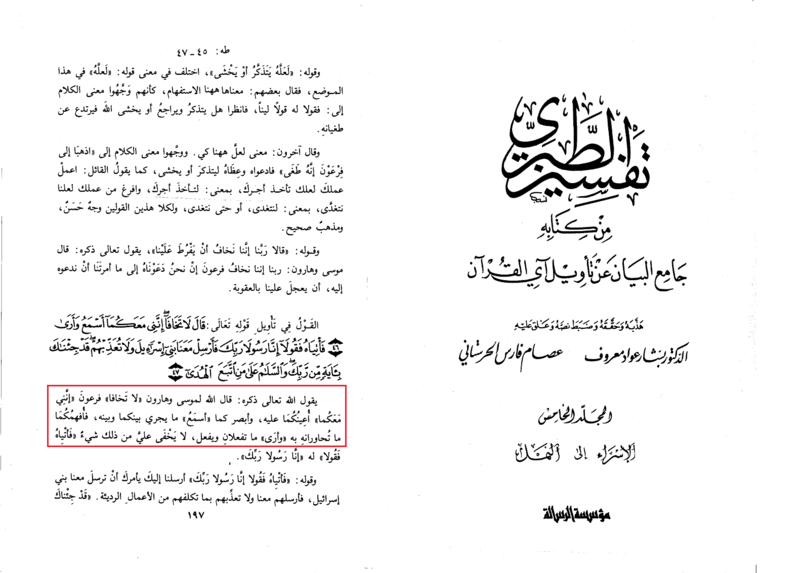 It seems al-Razi has hand picked what suited his agenda, rejecting other ayahs along the way. Allah (swt) here specifically mentions that him being “hearing and seeing” of the events with Pharaoh is what eased the fear of them both. In the case of 58:7 it is used to put fear in the disbelievers, while in this ayah (20:46) it has the opposite effect on the believers! So from this Sunni tafseer we see that this statement of “I [Allah] is with you” is said to dispel fear, just as Abu Bakr had in the cave. Through Musa (as) and Haroon (as) knowing that Allah (swt) is aware of all that they do, seeing their actions as well as that of Pharaoh, knowing that Allah (swt) would not let them fail, was enough to remove any fear they had. This opposes in what al-Qurtubi said, asserting that “[I] Allah is with you” it does not include the “general meaning” of “ma`iya” of Allah (swt) seeing and hearing all, where as it is in reality inclusive of both. i.e. Allah (swt) being “with you” means he sees all and hears all around you, and because of this he will support those who deserve to be supported (believers), and defeat those who deserve to be defeated (disbelievers). In the case of 20:46, He (swt) saw the actions and heard the words of Musa (as) and Haroon (as), so He (swt) aided them; while He (swt) saw the actions and words of Pharaoh, and He (swt) destroyed him. 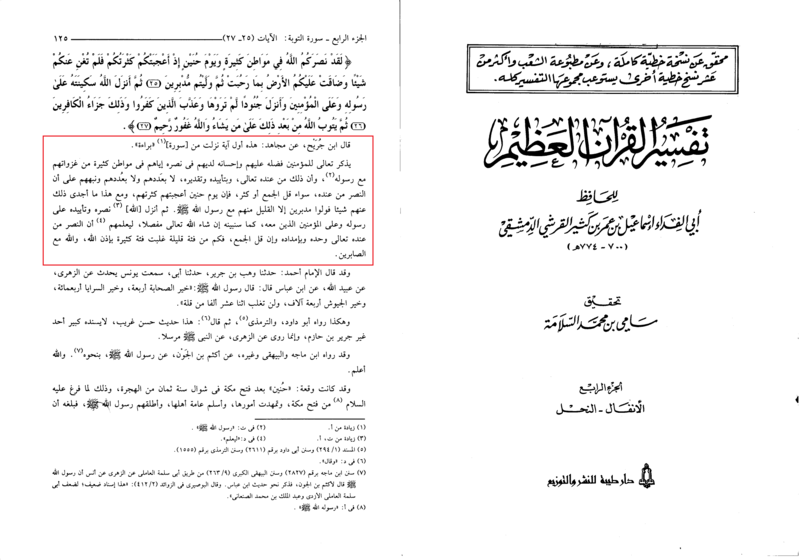 Now it is clear the words of al-Qurtubi are baseless. Now, the question is raised: If Allah (swt) supported and aided BOTH the Prophet (sawa) and Abu Bakr, doesn’t this give a big merit to Abu Bakr? If it was said to give calmness to Abu Bakr, doesn’t this mean he is a believer? To answer this, we need to look at the context of 9:40. The topic/theme of the ayah is the support of Allah (swt) for the Prophet (sawa) even if there is no one else to support him, and the support of Allah (swt) is enough and sufficient. 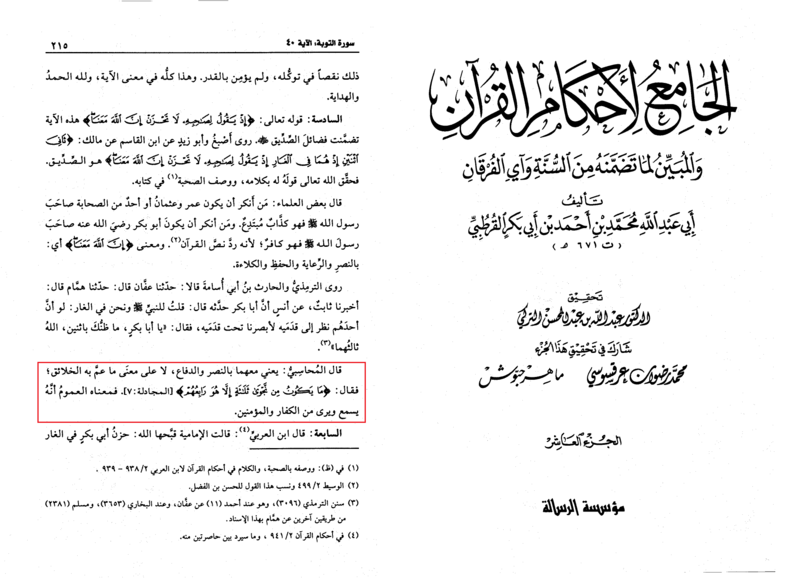 The ayahs previous to 9:40 talk about the lack of support the Prophet (sawa) received when he (sawa) called for Jihad, and the hypocritical ones of the companions did not go forward and join him, and furthermore not joining will be to your their detriment and it would not harm Allah (swt) in the least! 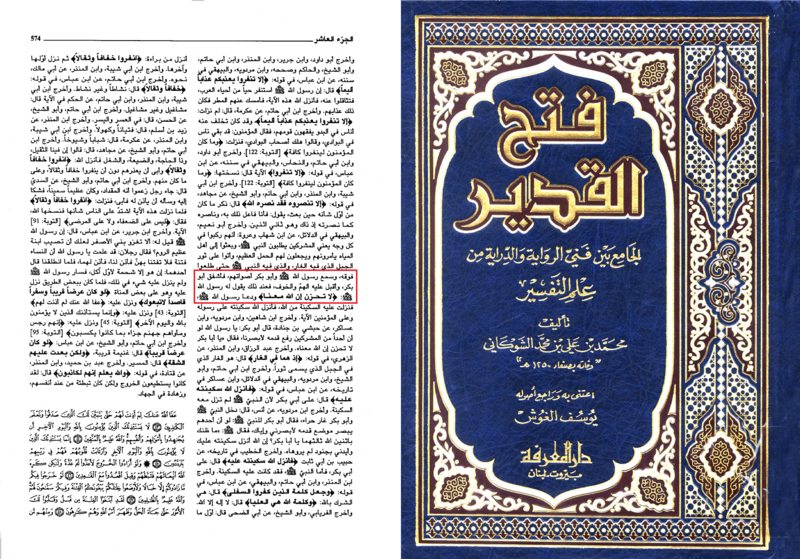 We can now see a clear picture being painted in this surah leading up to ayah 9:40. The purpose of the ayah is to show that if the Prophet (sawa) was supported by Allah (swt) while alone in the cave with a man who had lost hope in being saved, then what makes you think Allah (swt) will not support the Prophet (sawa) on the battlegrounds, even if you flee? The Prophet (sawa) saying “with us” instead of “with me” is to point out to Abu Bakr that his false perceptions was incorrect, and that he did not realise that Allah (swt) was also present and he is the supporter of the Prophet (sawa). Note, that the ayah is suggesting that Allah’s being in the cave is conditional upon the Prophet (sawa) being present in there. If Abu Bakr was not in the cave, Allah (swt) would still be with the Prophet (sawa) – while if the Prophet (sawa) was not the cave, and ALL the companions would have gathered into the cave in great numbers, there is no guarantee that Allah (swt) would be with them in support, just as in Hunayn, when their great numbers had pleased them but it did not avail them at all – but for those who were around the Prophet (sawa) – following his orders and did not flee – calmness and aid was given to them simply because they were around the Prophet (sawa) in obedience. According to ibn Katheer, and Bukhari, this ayah was revealed upon Polytheists, such as Abu Jahl. If even Abu Jahl had protection from Allah (swt) only because the Prophet (sawa) was in his presence, then surely Abu Bakr would too. In the next section we disect the statement through the hadiths, and show what is meant by “Allah is with us”. 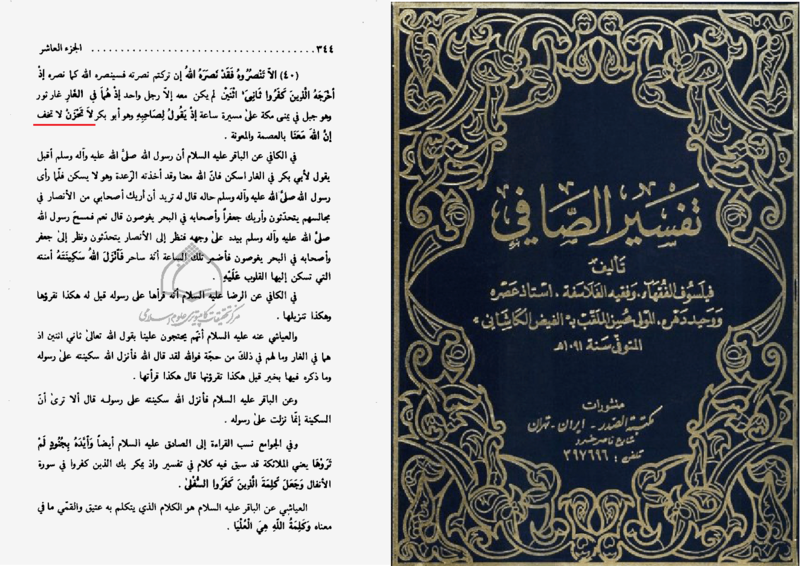 Reference: Sahih al-Bukhari 3653; Sahih al-Bukhari 3922, Sahih Muslim 2381, Jami` at-Tirmidhi Vol. 5, Book 44, Hadith 3096 (Sahih), Musnad Ahmad (Sahih) etc. The Prophet (sawa) here clearly states the meaning of the ayah and statement “surely Allah is with us” by explaining that they are not alone in the cave as Abu Bakr thought. Allah (swt) explained the apparent with “he being the second of the two, when they were both in the cave“, stressing that there was only two, but never is there two except with Allah (swt) being the third! Indeed, Allah (swt) was the third person present, because Allah (swt) is always with the Prophet (sawa) in support, and indeed he sees and hears all things. 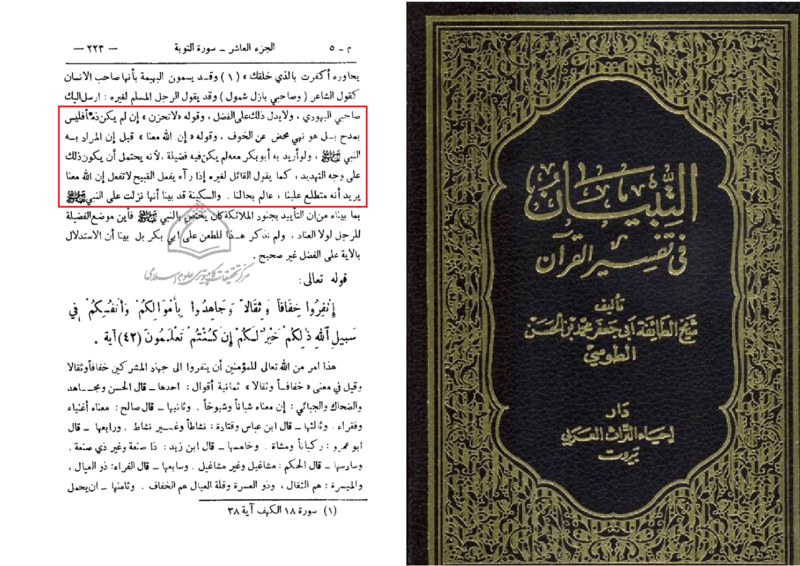 The Prophet (sawa) did not actually say “Allah is with us” ? When we examine the words of Allah (swt) in the Qur’an, and when He (swt) quotes certain people, we find that there is a lack of precision in what is said. The reason for the lack of precision is not because of a fault in the Qur’an, but rather because of the style of the Qur’an. The purpose of the Qur’an is not to quote the words exactly, but rather portray the message and purpose of the words to fit the context of the theme in the surah. So we see clearly the Qur’an is not to considered precise when looking at quotations, as it may vary from the exact words being used. Thus, when we look at the words of Abu Bakr, to see what exactly was said by the Prophet (sawa) to him, we find a stark contrast and difference in meaning to how many ‘Sunni’ commentators perceive it. It is quite possible that the exact words said by the Prophet (sawa) was not “surely Allah is with us” but rather “O Abu Bakr! What do you think of two (persons) the third of whom is Allah?” – and He (swt) used the specific wording of “surely Allah is with us” for the context of the ayah, explaining that Allah (swt) is always with the Prophet (sawa). 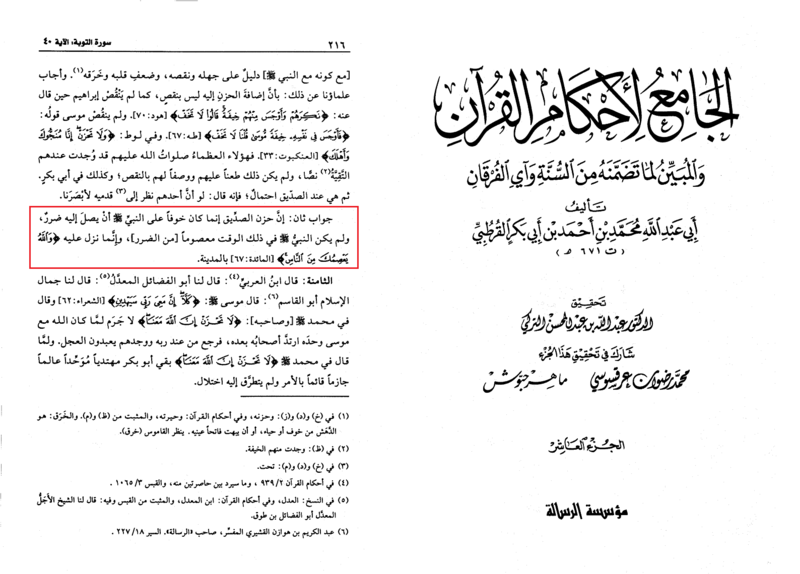 Remember, this is according to sahih sunni hadiths, from the mouth of Abu Bakr himself. If we accept this idea, it means nothing more than Allah (swt) is present among us as the third in the cave with two others in it. As explained by the beginning of the ayah, Allah (swt) is always with the Prophet (sawa) in support of him. “If you will not aid him, Allah certainly aided him.” This is why Allah (swt) was the third in the cave when there were only two (apparently) present, because he will support the Prophet (sawa) where ever he is. With this being said, it is no longer possible to draw parallels of this ayah with ayahs such as “Indeed, Allah is with those who fear Him and those who are doers of good.” (16:128) which has an entirely different meaning to “O Abu Bakr! What do you think of two (persons) the third of whom is Allah?”. Yes, there are hadiths that quote the Qur’an directly and say that the Prophet (sawa) literally said: “surely Allah is with us“, but these are either weak, narrated by other than Abu Bakr (i.e. were not present), or are quoting the Qur’an directly and not the actual words of the Prophet (sawa). Not to mention the most reliable of hadiths state the words were “O Abu Bakr! 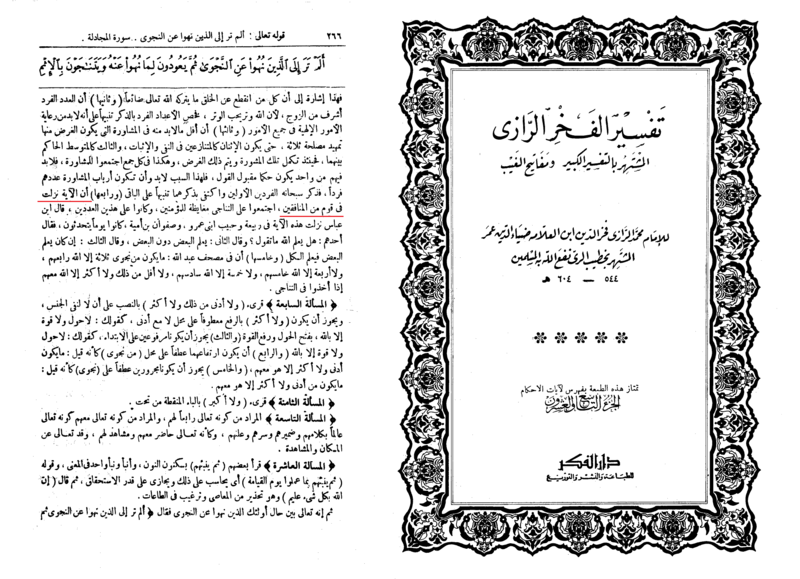 What do you think of two (persons) the third of whom is Allah?” found in Bukhari, Muslim, and multiple reliable books and tafseers of the ‘Sunnis’! 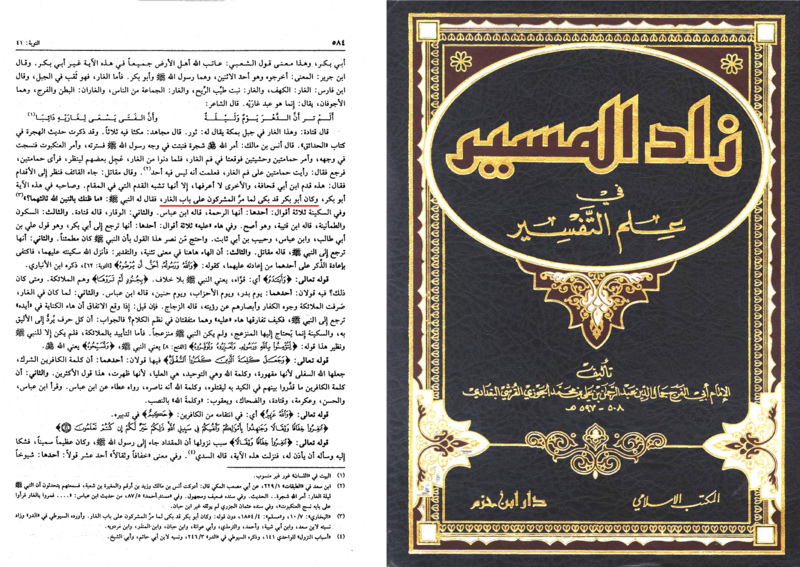 Another strong point that shows that Allah (swt) was present in the cave exclusively because of the Prophet (sawa) and His (swt) support for him (sawa), is the next part of the ayah, where Allah (swt) says: “So Allah sent down His tranquillity upon him and strengthened him with hosts which you did not see“, him being the Prophet (sawa). Allah (swt) did not say “them” which would include Abu Bakr. If Allah was “with” Abu Bakr in support and aid then Allah (swt) would have said “So Allah sent down His tranquillity upon them both and strengthened them both with hosts which you did not see.“ We will discuss who “him” is referring to and why Allah (swt) did not use “them” in part 4, God willing. Some claim that because the Prophet (sawa) said “Allah is with us” and not “Allah is with me”, for if the above claims were true then he (sawa) would have said “we”. Reply: This would not be fitting in terms of the context and lack in eloquence. Allah (swt) suggests the Prophet (sawa) said “we” because he (sawa) was replying to Abu Bakr’s fears that the Polytheists would come to know that they are both in the cave, and them kill them both. The Prophet (sawa) suggests that you, Abu Bakr will be protected because if you are killed it would automatically mean I will also be killed – and how can that be when the third person among us is Allah (swt) who is my supporter? So fear not, no harm will befall you because Allah (swt) is present with us. I saw the feet of the polytheists very close to us as we were in the cave. I said: Allah’s Messenger, if one amongst them were to see at his feet he would have surely seen us. Thereupon he said: Abu Bakr, what can befall two who have Allah as the third One with them. He did not say “Indeed, with us is our Lord””? Here it is clear that the way that Musa (as) delivered the children of Israel was through the guidance that Allah (swt) gave him in inspiring him to strike the sea with his staff. This inspiration only came to Musa (as), and not the children of Israel (as). Thus, when the children of Israel thought they were doomed, Musa (as) rejected this knowing that Allah (swt) will guide him to a solution to their escape. The a few ayahs down it shows that through this guidance, all of the children of Israel were saved, and not just Musa (as). Keeping this ayah in mind – if we take the meaning of “Allah is with me” to ONLY mean support and aid from Allah (swt), did he not aid and support all of the children when he saved them all? So why did Musa (as) only say “Allah is with me” and not “us” ? Obviously the answer lies within the context, that this is speaking in terms of aid and support through guidance to a solution, which was exclusive to Musa (as). One must also remember that this “ma`yah” which was exclusive to Musa (as) does not mean that anyone who was not included in this does not have Allah (swt) with him, for certainly Haroon (as) was with Musa (as) during this incident, and we know from earlier that Allah (swt) was also with him! 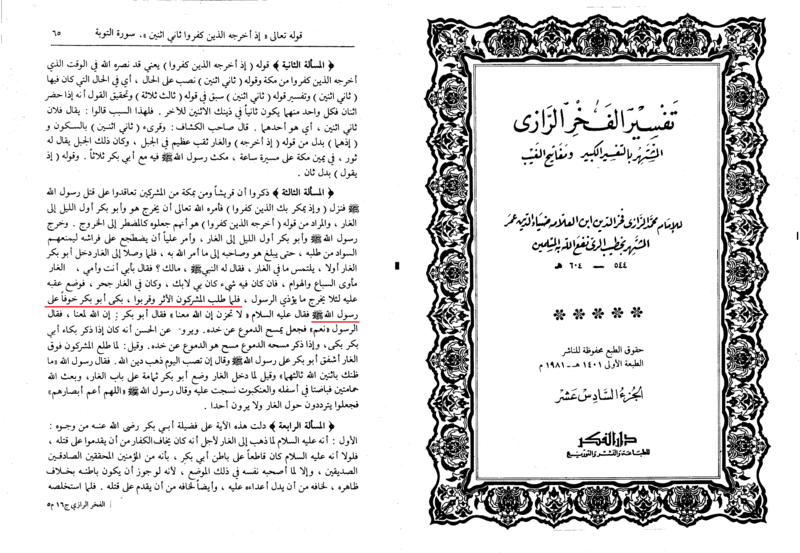 Thus, this specific “ma`yah” was in relation to guidance in terms of inspiration, which at that point of time was exclusive to Musa (as). Returning to 9:40, we see that the “ma`yah” was not in terms of guidance at all, but in fact Allah (swt) saving the Prophet (sawa) and his companion from any harm by His (swt) own plan – i.e. the spider web, pigeon laying eggs, and blinding of the Polytheists. Prophet Muhammad (sawa) was not guided into performing any action specifically, which led to their survival, unlike Musa (as). This is why the “ma`yah” here has a completely different context. In a variation of the hadith, in the most authentic books of the ‘Sunnis’, al-Bukhari, Abu Bakr narrates himself that the Prophet (sawa) told him to shut up! Obviously, the Prophet (sawa) was not praising Abu Bakr here for his excessive fear and crying, which would have potentially giving away their location. 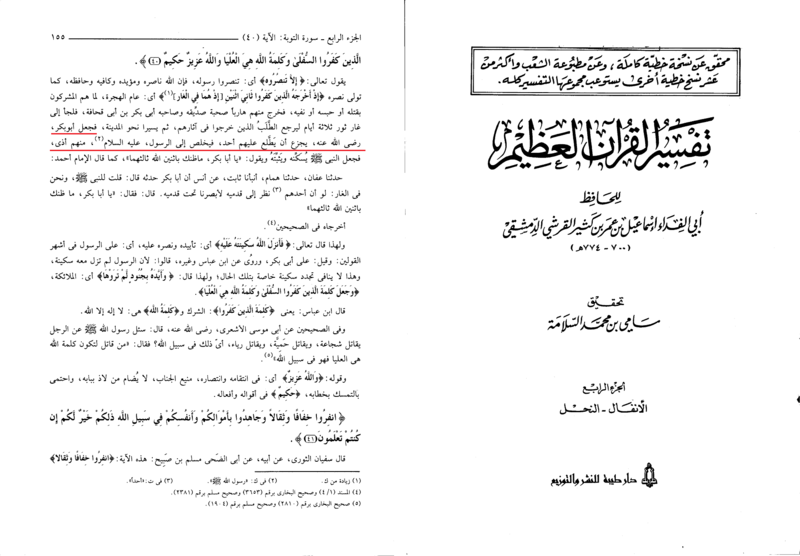 This wording clearly shows that the prophet was admonishing Abu Bakr – something which is far from merit. 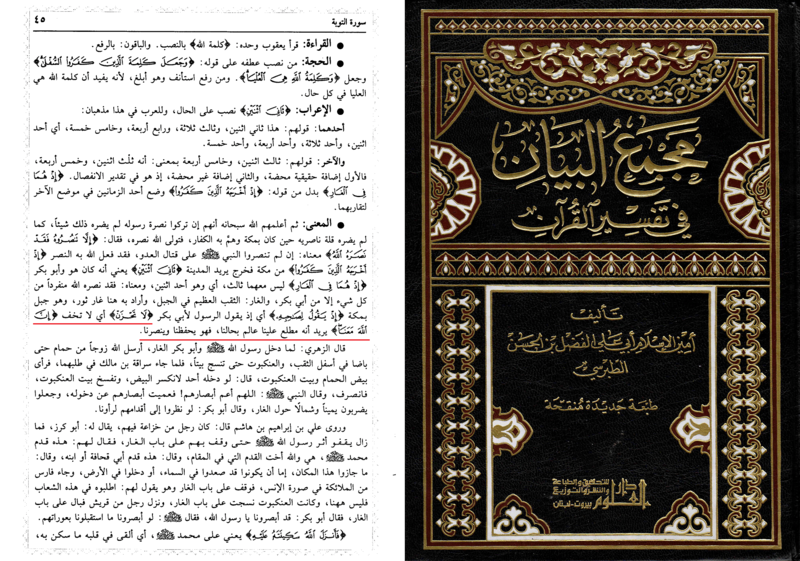 The word uskut (اسْكُتْ) was translated as “be quiet!” by one of the translators of Bukhari (Mohsin Khan). It is important to note that firstly, this statement is always said with exclamation and urgency, this is why you will notice “!” always after the translated word. Secondly, the more accurate wording would be “shut up.” See here and here (minute 3:50) for more accurate translations. In this ayah, Allah (swt) wishes to portray his support for the Prophet (sawa) at all times despite the number of supporters he has. The only reason why Abu Bakr is mentioned is to demonstrate that even if the Prophet (sawa) was alone with one other person, who had already given up hope – know that Allah (swt) is present. He hears all, and sees all. He hears and sees the situation of the Prophet (sawa) [in this case being isolated in the cave] and that of the enemies [approaching the cave] – and always is Allah (swt) with his Prophet (sawa) – ready to aid and support him, and to defeat his enemies. 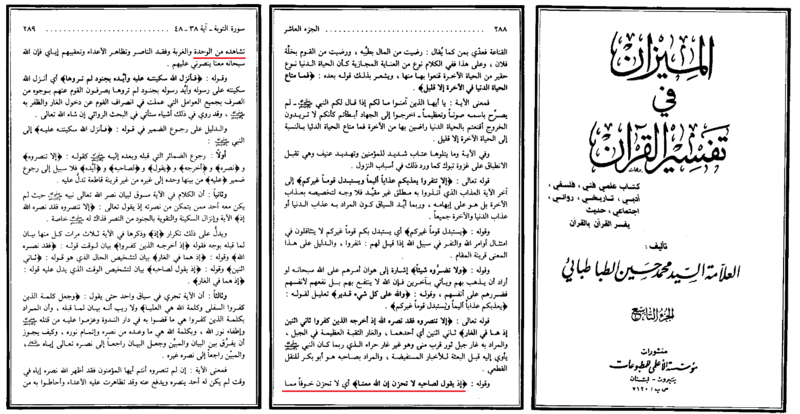 The Prophet (sawa) admonishes Abu Bakr for his grief by telling him to shut up! He (sawa) the explains to Abu Bakr that his perceiving that there was only two people in the cave and their doom was near – was wrong, and that Allah (swt) was also present, seeing and hearing all, and will support the Prophet (sawa) where ever he is – be it on the battlefield while the companions flee, or alone in a cave.